No, I can’t say I *like* doing laundry! I usually get busy doing other things and forget I have a load in until about five minutes before bedtime – ugh! Cost and chemical free are most important for me. I have sensitive skin and like my blacks BLACK! I used Dreft for years, but recently switched to Melaleuca products. They work great for me and they are friendly to the environment, too! oooh, I hate when I do that and forget a load is in the wash until bed time! 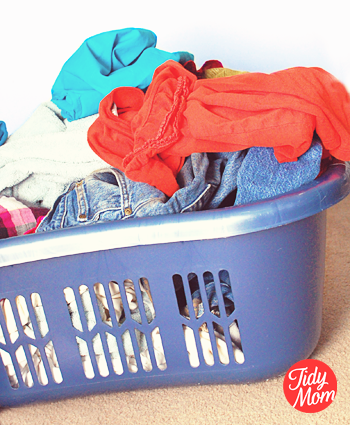 DOING the laundry is OK…it’s the putting it away that I don’t like (my kids are too young to do it themselves). I love doing laundry…I find it relaxing! There is nothing better than warm, comforting laundry, fresh out of the dryer! I guess I am not really a good *shopper* when it comes to laundry detergent. 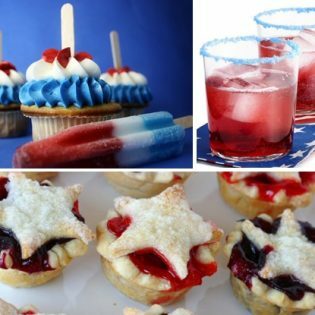 I keep thinking about making my own, actually! yes yes on the relaxing and such satisfaction in seeing all those CLEAN articles lined up in closets and drawers. It is a project that can have completed stamped on it everytime.!!! A friend of our recently bought a front loading washer and dryer so they gave us the container (brand new!!) 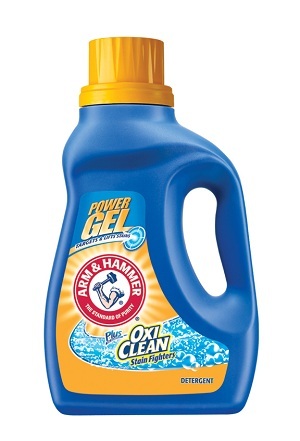 of Arm & Hammer OxiClean…I have to say, I absolutely love it!! It is all we use now. It smells great, and gets everything nice and clean. Who knew baking soda had so many uses? Growing up my mom always had us put a little baking soda with our toothpaste to brush our teeth, and she put some in laundry as well. I try to tell myself laundry is fun to do, but there are 5 of us in my house- 3 boys. If I could have 1 day go by without doing it, once a week, it would make the task a little more pleasant. I hate seeing clothes piled up so no matter what, it gets done. Great blog btw, I found it yesterday!! I’ve been making my own launry detergent for a year now, and love it! The savings are amazing, and you can scent it if you’d like. It is dirt cheap to make (yes, a pun!) and works so good. The hubby is a welder, I have a 6 year old son and a 9 month old daughter. i have never tried this! i think i’ll pick some up. my kids have done their own laundry since they were in middle school – if that answers the DO I LIKE LAUNDRY question!! I DESPISE laundry. I think I’ve finally found a system to keeping on track and that’s just doing a load every single day and not doing another one until I’ve put the laundry that’s clean and dry away. Otherwise I end up with piles and piles of clean laundry all over the laundry room floor. Since I have little kids, I definitely need something with stain fighting power. I try to pretreat, but it’s nice when you don’t have to since that saves time. Price is important too and I try to use detergents that don’t have many potential skin/allergy irritants as my son has asthma and sensitive skin. I’ve never tried this one so I’ll be interested to here how it works. I do add baking soda to my whites loads. I will check out Arm & Hammer’s detergent though – it sounds awesome!! GET out Jen!! !………mine does a lot of ours as well!!! too funny!!! People LIKE to do laundry??? Whuh??? I like for my detergent to smell fresh and clean, have stain removing power, and not be a budget buster. Is that so much to ask? I think I would like doing laundry better if I didn’t have to drag it all out to a laundromat! That being said, detergent varies based on cost/coupons. I have used A&H products in the past and like them. Scent is my 2nd reason for picking detergent LOL! But seriously, laundromat dryers run HOT and clothes can take on a hot smell if you don’t have a good scented soap. Weird, right? no, I totally get what you are saying……so yes, great smelling detergent would help!! I enjoy doing laundry. I live on a farm and depend heavily on stain removers and don’t really count on a detergent for that. What I am really looking for is a laundry product that makes my clothes smell good. I take them out of the dryer and they just have that heated dryer smell. Not the kind of smell I want for my towels. Not a fan of doing laundry. I love folding warm, clean towels…but that’s it. I’ve been throwing a load in every morning and that helps me stay caught up. And as far as detergent goes, I go for smell, price, and color safe bleach. I use this Arm & Hammer detergent and love it! I can always find it on sale, sometimes at Big Lots, and it does a great job of getting my clothes fresh and clean. I don’t mind washing or folding laundry, just hate putting it away. I LOVE doing laundry!! I have a husband and 7-year-old daughter, not such a busy household like the others who posted. I favor TIDE, I find it is the Best detergent. It can get pricey, but if I prefer it. If I’m low on cash, I’ll buy a cheaper brand. Nothing wrong with loving doing laundry!!! I can honestly say that I absolutely HATE doing laundry for our family of 6. Thank goodness my two older children (ages 12 and 10) have been taught how to help out or I would never get it all done! My very favorite laundry tip is to add OxiClean to the load…gets out so many stains that I would miss! I actually don’t mind doing laundry, but here at the apartment we only have laundry downstairs, and somehow lugging a heavy basket of laundry up and down stairs doesn’t agree with my lupus. I look for laundry detergent that is going to get my clothes clean and smell nice, but the fiance is allergic to everything and can’t handle scented anything, so now my clothes just smell like nothing. And just think, they could be smelling like mango sunset or whatever the latest, coolest scent is! I hear ya!….my laundry is in our basement and it’s a pain! Love Arm & Hammer w/Oxy Clean. The smell is wonderful and it really gets cloths clean. The best part is the price, 7 and change. Oxy clean alone is $10.00 plus Tide, another $12.00. 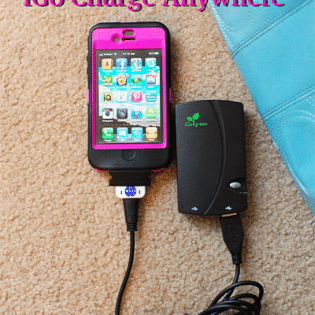 It’s a bargain and it works plus it’s about $14.00 less. What’s not to like……. You know, I’m one of those weirdos who doesn’t mind laundry. I don’t know, it’s not so bad. then again, I only have 1 child, and a hubby that doesn’t have a dirty job or anything like that. So the amount we have is fairly simple to keep up with. I do 1 load a day, and I’ve also been showing the Boy how to do it. We have a stackable unit, he would also put the laundry in the dryer if he could reach it, but he can’t yet, lol. I’ll be interested to see how the Arm & Hammer works out for you. Plus……I started out with a ringer washer and no dryer so doing laundry is not a chore for me……..ironing? That’s another story. We lived in a tiny house when first married. The ringer washer (brought it from parents home) was in the basement (started out with a dirt floor) and we had to walk outside to get to the basement. That’s also where our bathroom was and me pregnant……but again, that’s another story. (~; We have everything we need on the first floor now. That was 46 years ago, life is so much easier. Do I dare admit that my husband does the laundry probably more often than I do? It was one of those things I taught him how to do early on in an attempt to maintain some sanity working 60 hours a week. No, I will not share him. I have to use HE detergent and buy whatever is on sale and I have a coupon for. Usually Purex, All or Wisk. I do add Clorox Color Safe Bleach to all of my dark loads. It really helps keep the colors from fading. Now if they only had coupons for the Clorox! I can usually get the laundry washed and dried, its the folding and putting away that I tend to fall behind on. I have tried several different laundry detergents over the years. I have even tried making my own at home. Price and how it works are the two most important things for me. We are a one-income family so there is no room for wasteful spending. I have found that store brands do not work as well. They require more to get the job done and you are usually left with stains. I really like Method and Melalueca brands, but the budget does not allow for it. My budget friendly brand is Tide and yes I am loyal. I can use less soap to get the load clean and rarely have stains. Scent isn’t that big of a deal in the soap as I use softener and get my scent in that. I actually like to do laundry ssh…I don’t like it when it piles up but.. I like to fold everything so it looks neat 🙂 I’ve used Arm & Hammer for several years. I like it not only for the price but that fact that it cleans a smells great. I use to use Tide but it has just gotten too expensive and I don’t really find it cleans any better. Having the laundry on the second story has its drawbacks too. Noise is the biggest factor – early in the morning or late in the evening you wonder if you are interferring with anyone’s sleep; during the day it’s far enough away that I often don’t hear when the washer/dryer cycle has ended and forget about it for a while. Doing laundry is okay…I hate putting it away. Scent is definitely important. Laundry is never-ending around my house. I used a detergent that had A&H in it when my kids were younger. Both of my kids are in sports and now I use Tide as it gets so everything so much cleaner. I would have loved to have donated my 18yo son’s white baseball pants to the research. I’m not sure a product exists that will get that dirt out. I start out the season really well (but usually pretreat, presoak, short wash, re-treat and scrub, then rewash – at least once) but by 2/3 of the way through the season the pants are just beige. Needless to say laundry – not my fvorite thing. I don’t dislike doing the laundry, I dislike putting it away! I’m a long-time Cheer user at my husband’s request. It seemed to handle his dirty work clothes better. I use ALL Free and Clear for my clothes and anything else for everyone else in my family. I used to like doing the laundry when my first baby was born and for two years. All her clothes were so darn cute! With my second child, I got over the cuteness and I don’t love doing laundry and I put it off as long as possible! When the girls are asking me, “Mom, where’s my underpants?” I know it’s time to get started. Bad, I know! My oldest has eczema so I have to be careful what detergent I use, only non-perfume and non-bleach ones. Also, I have a front loader, and seem to be fighting a musty odor in our clothes. I recently heard adding vinegar to the softner spot will help with the smell. Stain-fighting power is the most important. Doing laundry is fine, but not folding clothes after laundry though. I LOVE laundry day,,,,,nothing better than fesh smelling clothes just out of the washer. I haven’t tried Arm & Hammer but I always look for unscented. Which is weird because I LOVE scents, but my family seems to have sensitive skin so I just try to keep things pure and without scent!!! I wouldn’t say that hate doing laundry, but I don’t love it either. I’m cool with the washing, drying, and folding…it’s the putting away that I hate. I’ll have to check out this laundry soap once I’m through this giant Gain that I bought from Costco. Ugh, I HATE laundry. Well the washing and drying part isn’t so bad it’s the lugging it around and folding it afterwards that I despise. I look for laundry detergents that are environmentally friendly, and scent-free. I don’t hate laundry – it is not my favorite chore, but it is by far not my least favorite chore! I have 6 kiddos (12 – 2)and a hubby that has a dirty job. I am always washing and drying and then when I have 10 or more loads done, I sit and fold while I watch tv at night (the only way I can justify in my head that it is okay to sit – LOL!). My biggest gripe about soaps – my whites!! I HATE grey whites! I have not found what works yet. I might have to try this out! Cost is definitely most important. I like it to smell nice, too. And no, I don’t like doing laundry. Who does? I just love your website! I actually love doing laundry.. i have a 19 mo old and go through clothes! We have a clothesline so i hang alot of stuff outside. Love the smell of clean clothes! i obsess over it. sadly, that’s probably why i spend so much on laundry… I have never used Arm and hammer before. I actually just received a coupon in the mail for it so i guess i might as well give it a try! Laundry is my nemesis. It seems to multiply and just when I think it is complete it comes back. I, honestly, do not know where it comes from, because most of it is not mine. 😉 Anyway, I look for a laundry detergent that is “free of dyes and fragrance” as well as economical. Ideally, it helps with stain-fighting and not just cleaning. I actually LIKE doing laundry. It is the one, ONE, household chore I enjoy. What do I look for in detergent? Cost is a definite factor, scent (sometimes we get the fragrance-free…don’t want to compete too much with my perfume ;)), and of course, I want it to work. I don’t mind the washing and drying part as much as I do the ironing and putting away. That’s bad, isn’t it? I WISH I could hand all my laundry duties over to someone else. Honestly. I’ll do all the dishes! The fresh clean scent of laundry detergent is my favorite thing, and I want that smell to last well after the clothes are out of the dryer! I have to admit that the thing I look for most in laundry detergent is the scent! I like for my clothes to smell super fresh, so I always buy a scented detergent that has a similarly matched scent of fabric softener for double-scent action! Throw in dryer sheets in a matching scent and I am a happy girl. Strangely enough, though… I really hate doing the laundry. Mostly just the folding part. Yes I love doing laundry, one of my favorite household chores. The fresh clean scent of my laundry is what I am looking for in my detergent, but I also don’t want the super strong scent. And of course, my laundry detergent should serve it purpose to remove and clean to stain.